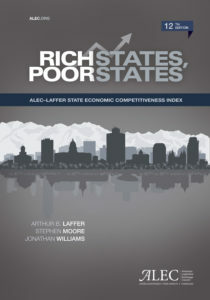 The Rich States, Poor States: ALEC-Laffer State Economic Competitiveness Index is a comprehensive report that ranks the economic competitiveness of states using fifteen equally weighted policy variables. Published annually by the American Legislative Exchange Council Center for State Fiscal Reform, Rich States, Poor States is used by state lawmakers across America to make critical policy decisions that protect hardworking taxpayers. Rich States, Poor States examines the latest movements in state economic growth. Variables include various tax rates, regulatory burdens and labor policies. Using the online companion tool available at RichStatesPoorStates.org, all Americans can use the same tool legislators have employed for a decade to adjust their state’s tax policy variables and find real solutions for economic security.